There are babies, babies and more babies showing up around here! (I guess I’ve left the time of life where all my friends are getting married and entered the time when everyone is having babies?) 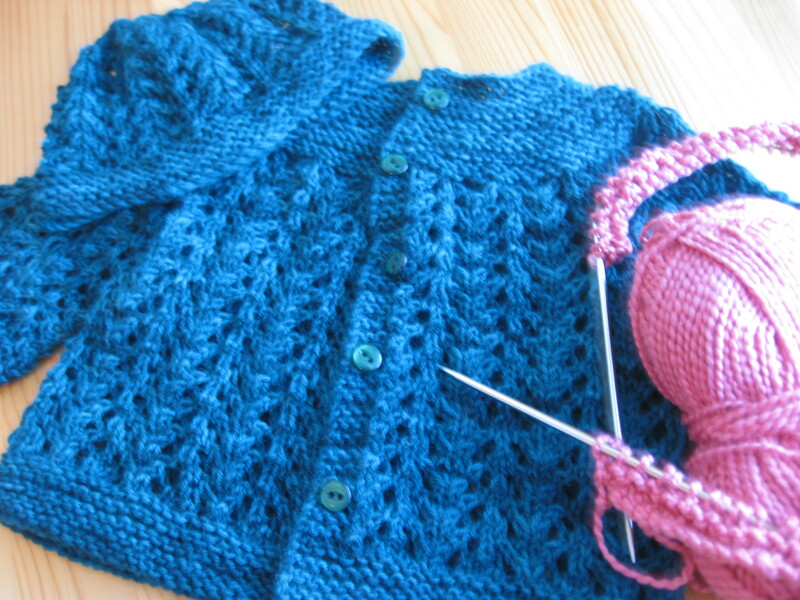 This trend isn’t a problem for me, though, because I love making baby stuff. 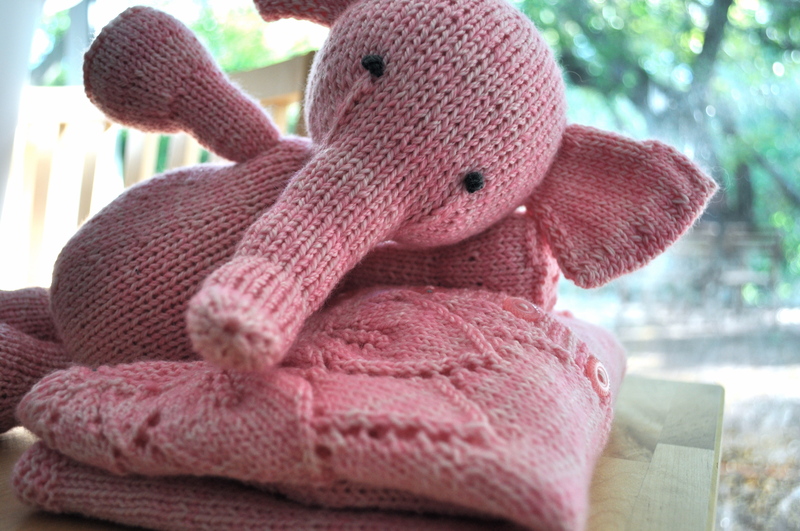 This time around, I was knitting for the new baby girl of an old family friend I grew up with. 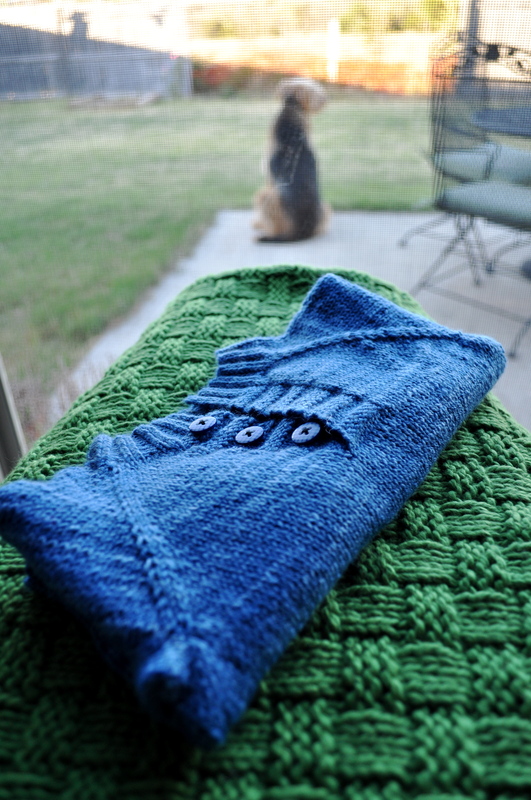 I had some Blue Sky Alpacas worsted cotton in shell left over from the basketweave baby blanket that I made for the baby of this particular family friend’s sister. That is, these new baby girls are cousins, so I liked the idea of making their baby blankets out of the same yarn, but I wanted to use a different pattern. 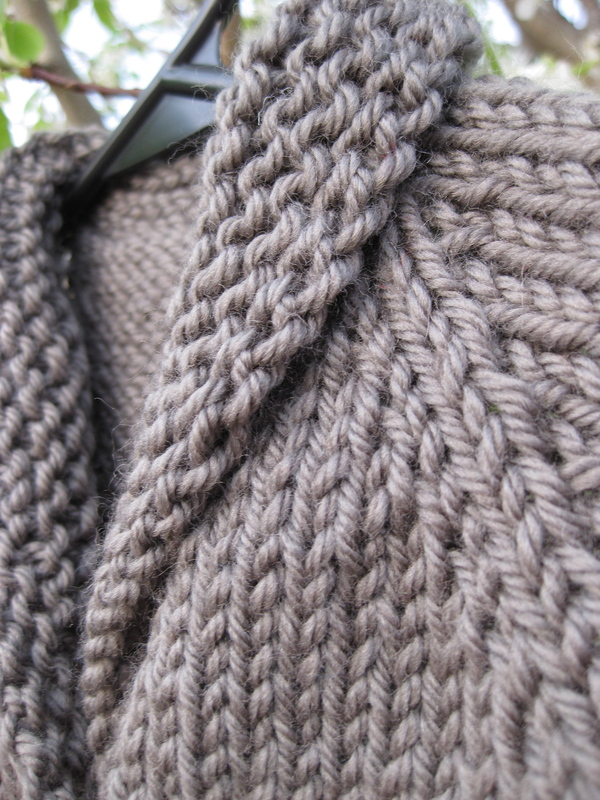 I settled on Jared Flood’s Wool Leaves, which is written for Cascade Eco Wool held double. 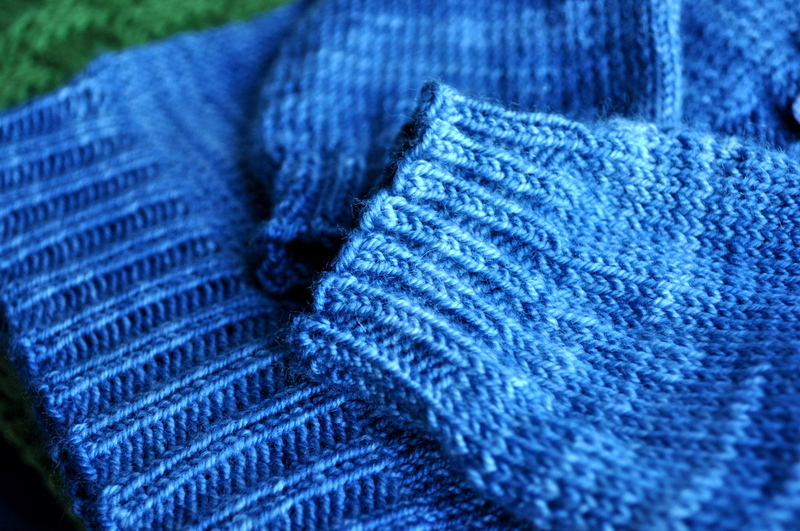 The Blue Sky Alpacas worsted cotton worked beautifully held double, and made quick work of the knitting. 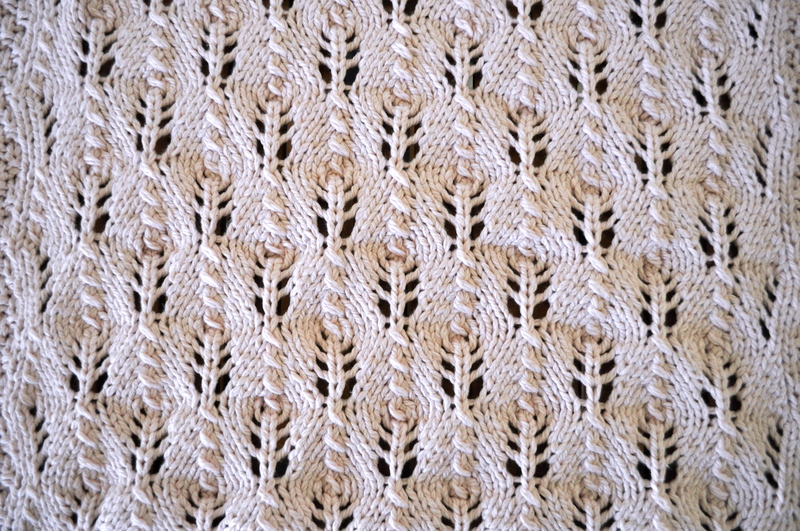 I love the graceful leaves in the pattern and (just like last time) I can’t get over how pretty the shell color is for a little baby girl blanket. 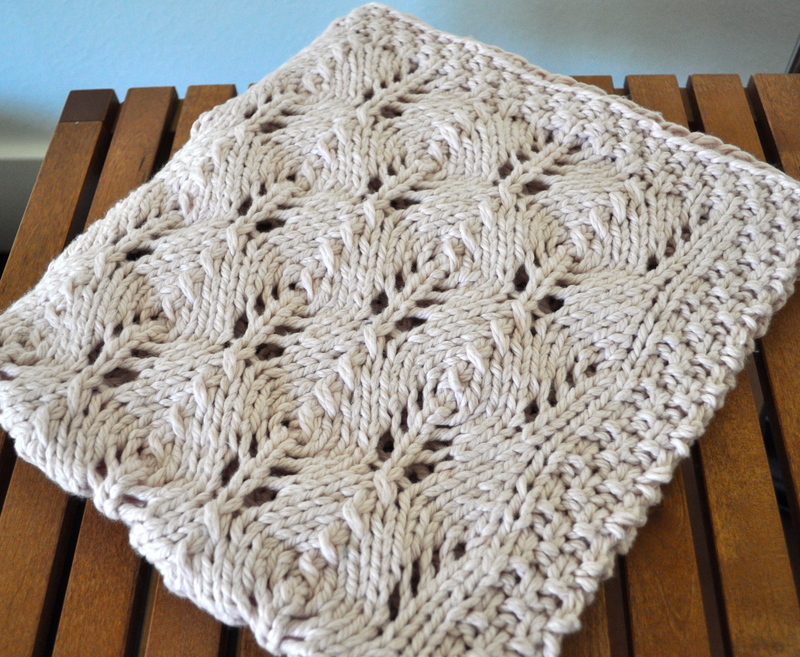 I had a little bit less than 4 skeins of the yarn, which meant I had to stop knitting with one lace repeat still called for in the pattern, but the blanket looks great and is still a good size even without that last repeat. 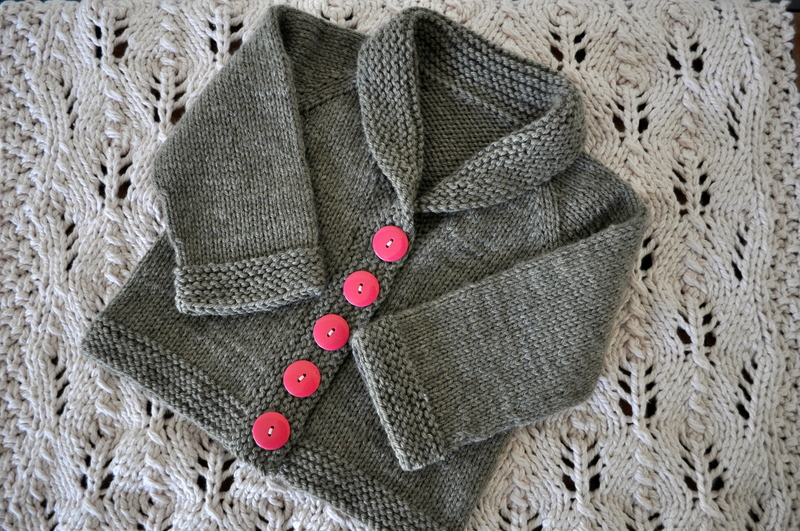 I also sent the 3 month Baby Sophisticate with bright pink buttons that I knit from the new pattern. 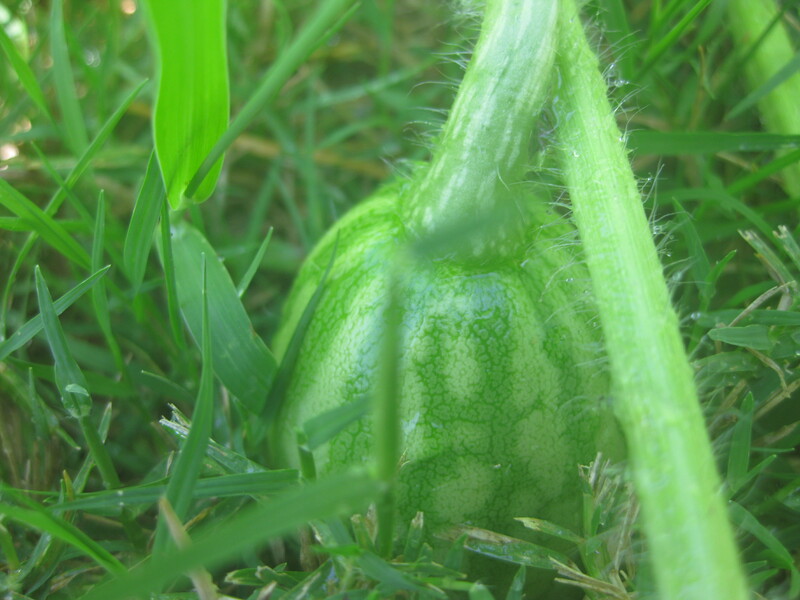 Hopefully it will be the perfect size once the weather cools down in a few months! 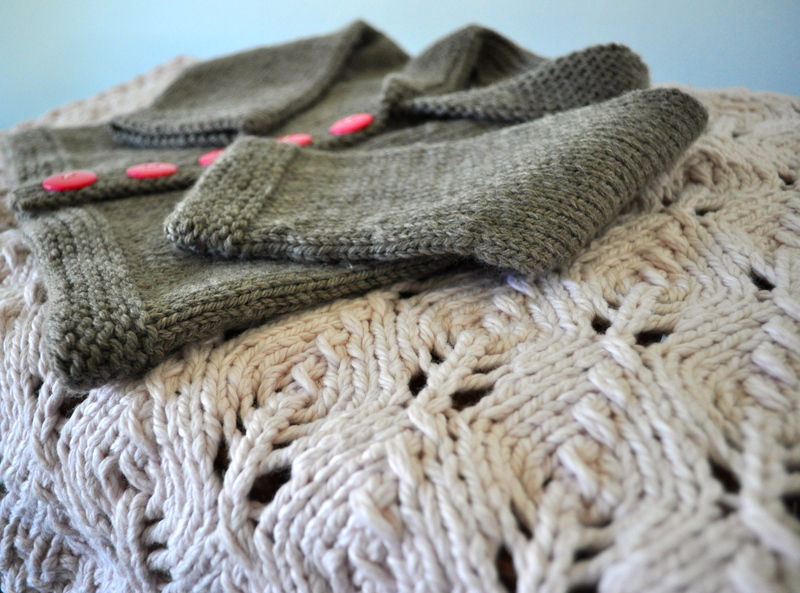 One of my lifelong friends recently had her second daughter and I pretty much went on a baby-knitting-spree! 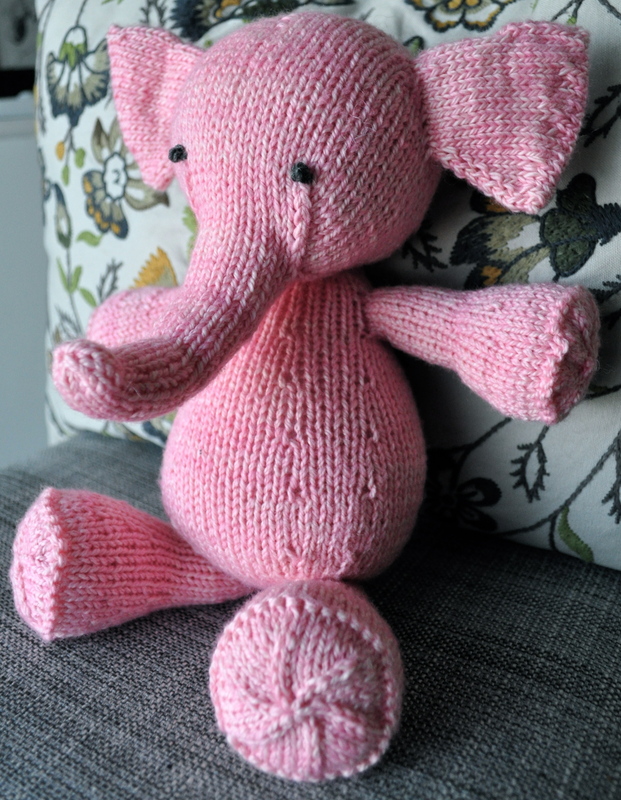 I will admit, this is partly because this is the first girl baby to come along in a while and I really, really wanted to knit some baby girl stuff. 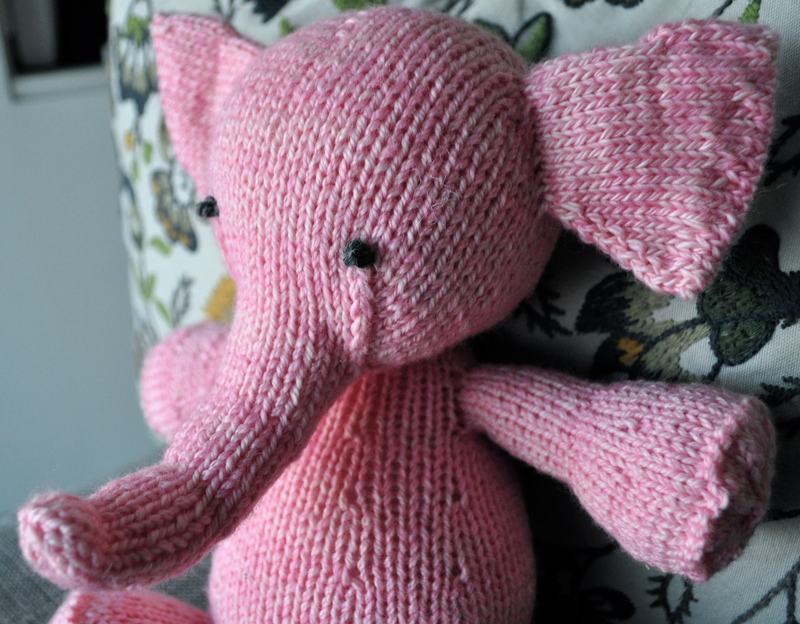 It’s also really special to knit for this baby girl because her sister, born a few years ago when I first started knitting, just happens to be the first person in this world that I ever knit anything for. 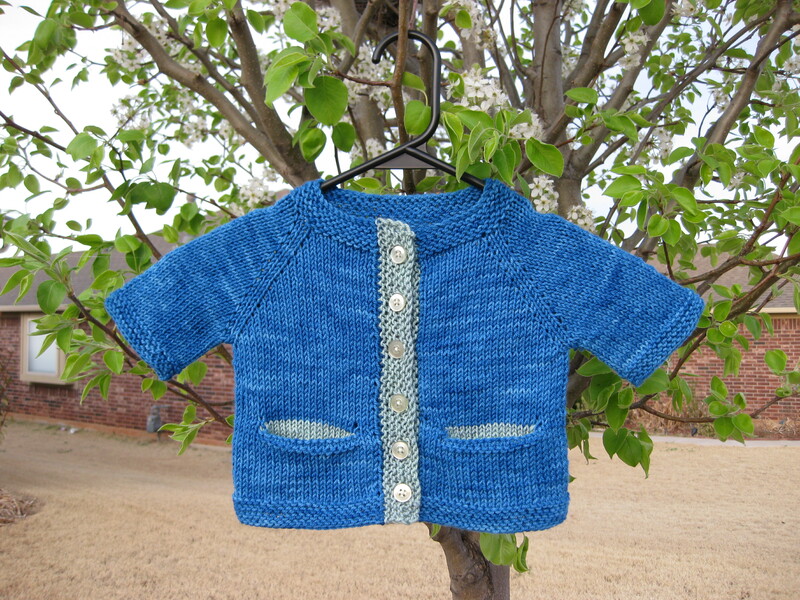 Back then, I went to Hobby Lobby and picked up one of those Lion Brand “pound of love” skeins in yellow and knit the baby pattern that came on the back of the ball band (it was simply stockinette and seed stitch stripes with a seed stitch border and a little hood). 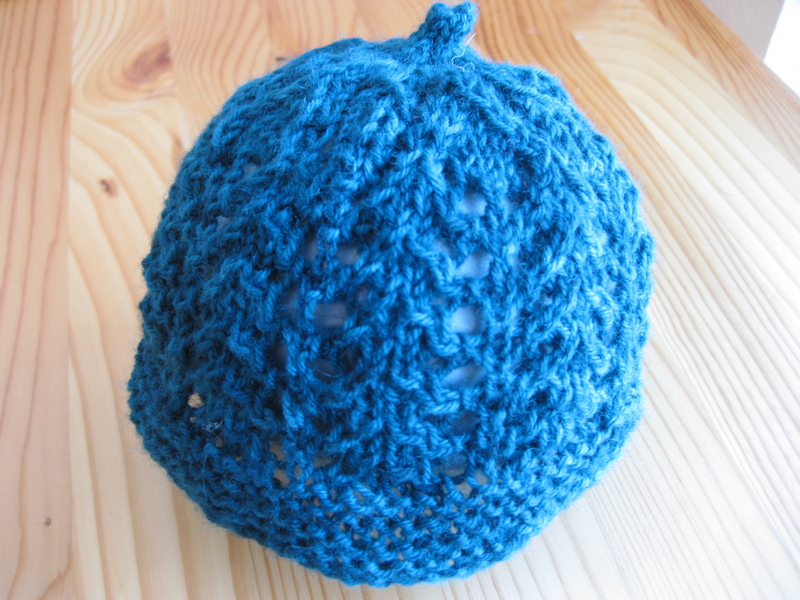 I also decided that I wanted to knit a little baby hat, and, in what I can only see now as foreshadowing of my design ambitions (though I didn’t see it that way at the time), I decided to make up the pattern myself. 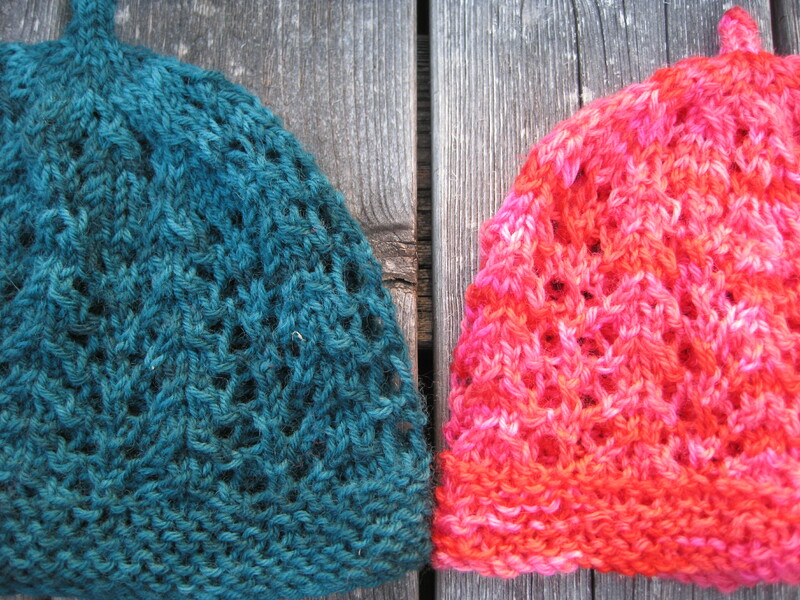 I ended up with a simple ribbed hat, but, get this – I had to seam up the decreases at the crown because I didn’t quite comprehend that I could make those little triangular shapes at the top of the hat all at the same time! I ended up with this flat piece of knitting with a bunch of points (like one of those paper crowns you get from restaurants as a kid) that I sewed up. Oh my goodness. It was a hat in the end though! 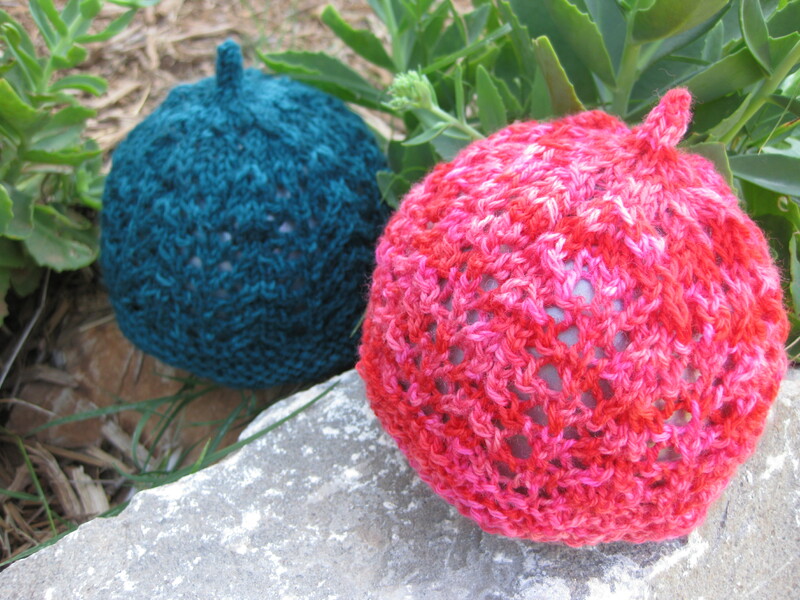 It even had a pom pon! 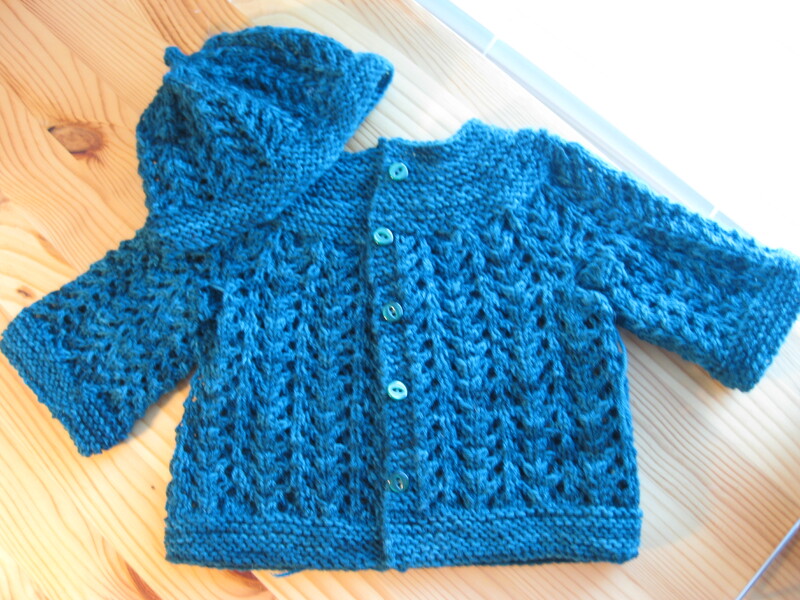 In any case, I have much more experience now, and I’ve knit a few things for this new baby. 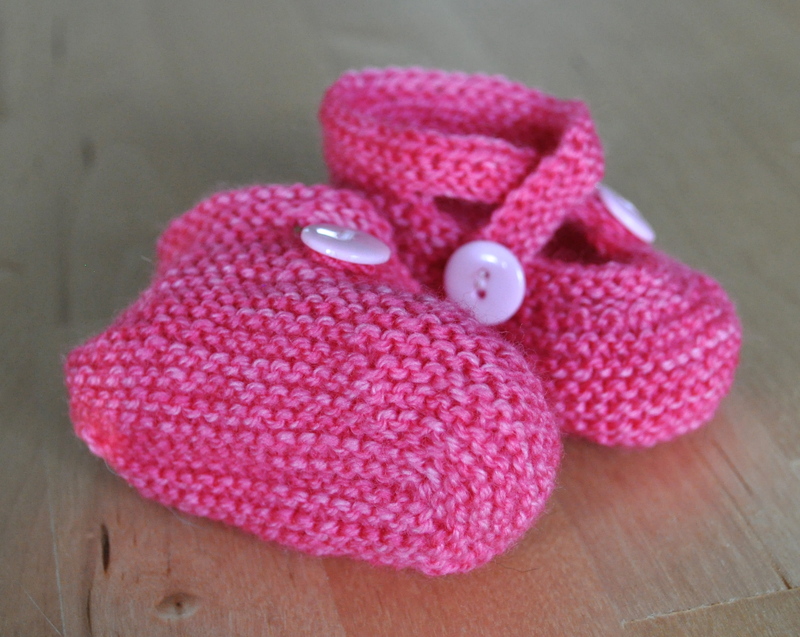 I’ve been wanting to knit the Saartje’s booties pattern by Saartje de Bruijn for a long time now, so I was very excited to have the opportunity to knit these for a baby girl. 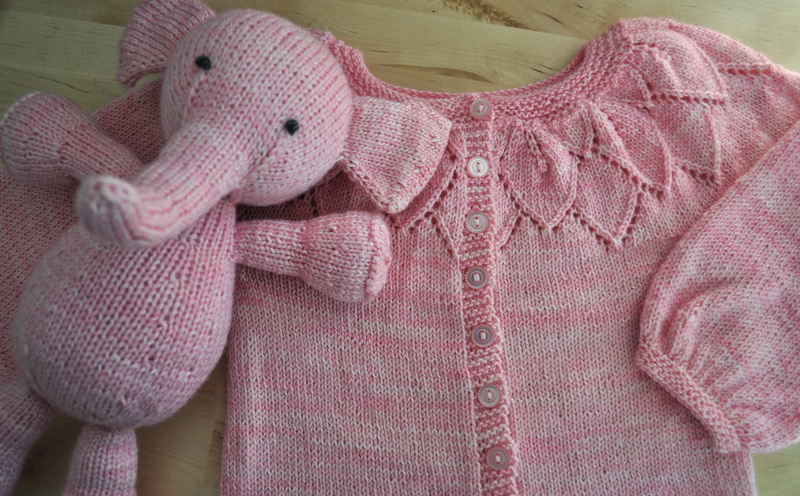 I had some pink yarn left over from a baby sweater (that I will post about soon), so I decided to make a set. 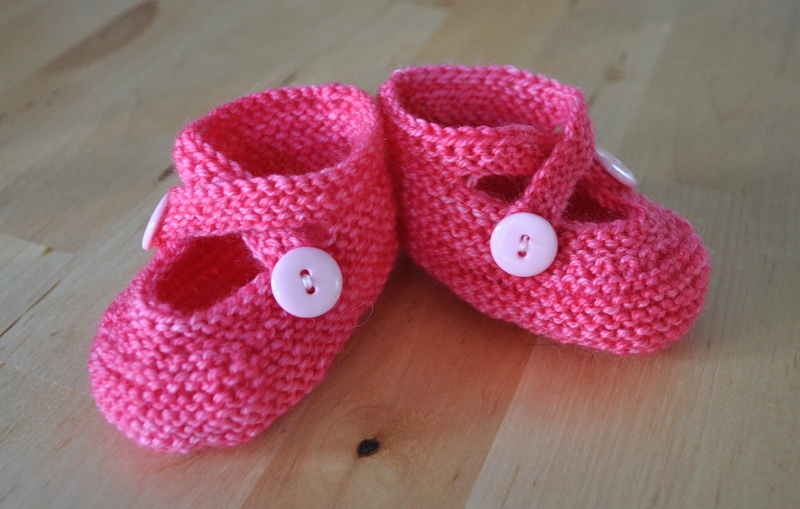 Saartje’s pattern is easy to follow, but I decided to knit the booties in the round. 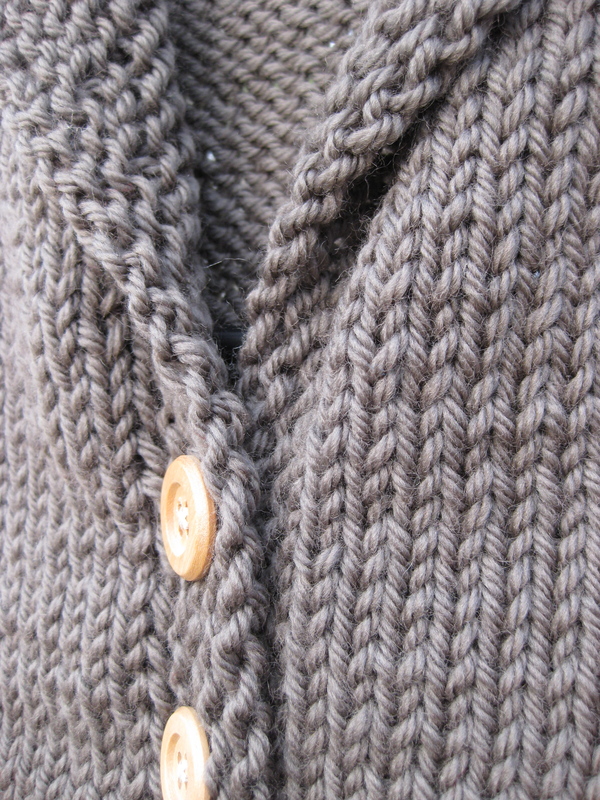 Quite a few people have written up seamless versions of this pattern on Ravelry, so if you’re interested in doing the same try a search over there. 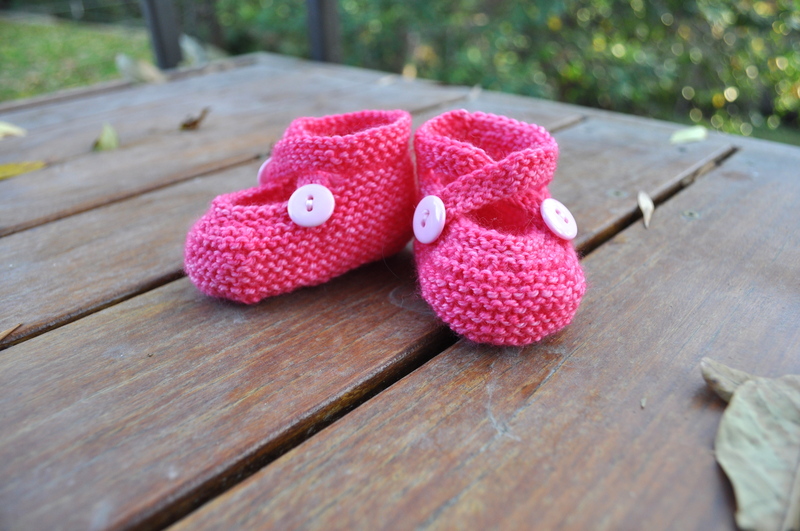 I didn’t use anyone else’s pattern and just knitted them up the way it made sense to me – I used Judy’s magic cast on to eliminate the seam at the bottom of the foot, then worked the same foot shaping outlined in the pattern. The yarn is Sweet Fiber Yarn Super Sweet Sock in Bloom. 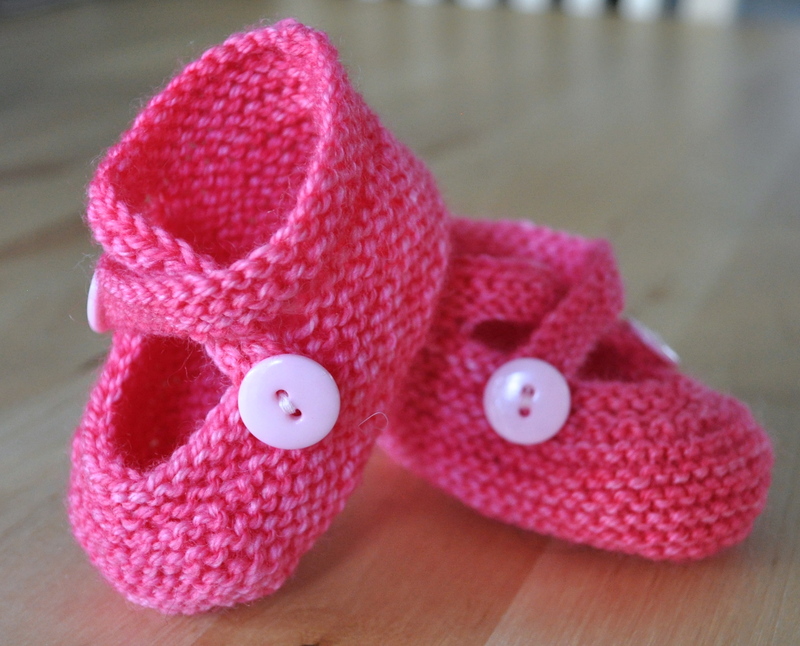 I’m in love with these little baby shoes! 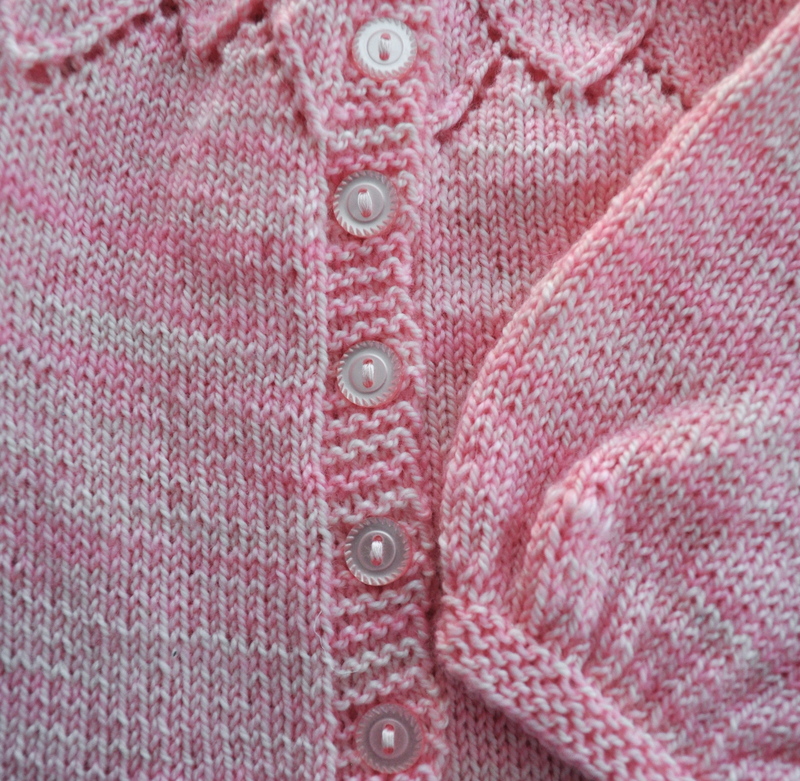 The light pink buttons are the same as those on the matching sweater, and I just think the whole effect is too cute! Lately, I’ve been working on a few little things for the newest member of my extended family, my second cousin – er, first cousin once removed? 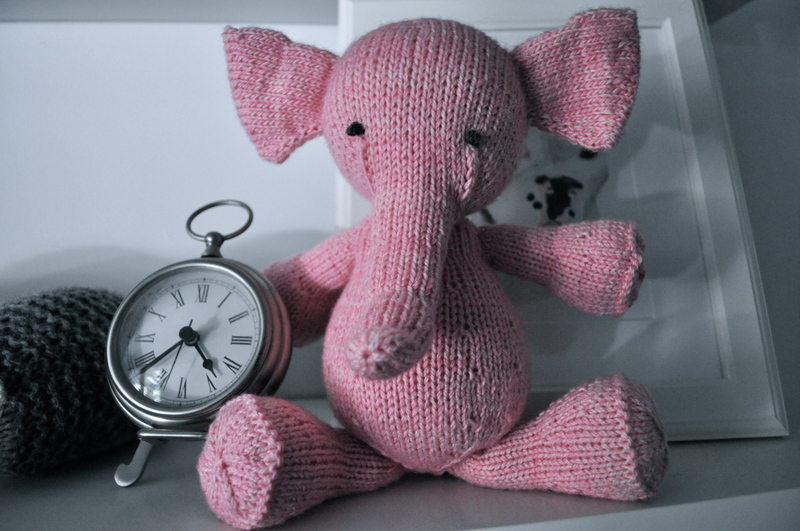 Hmm, not really sure what the classification is, but I do know that he’s a little bitty guy and definitely deserves some itty bitty knitted things to keep him warm! 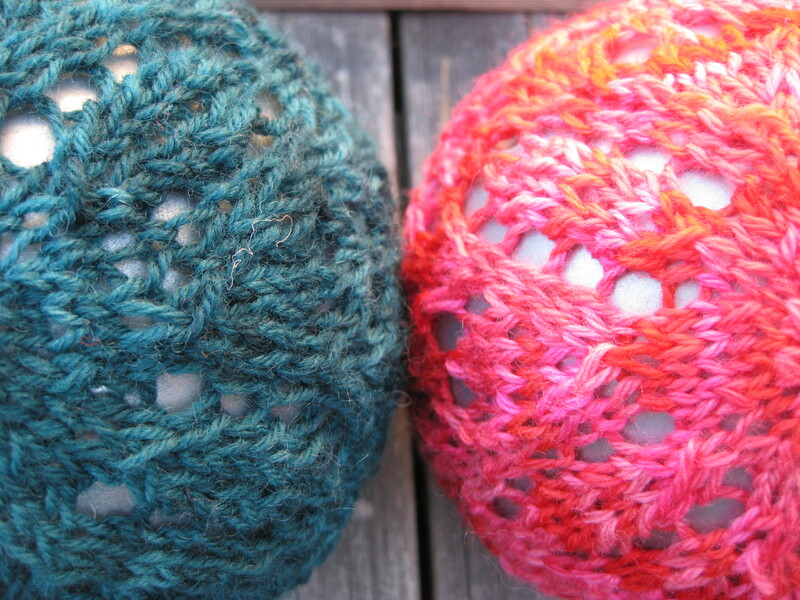 Enter obsessive, related knitter (me). 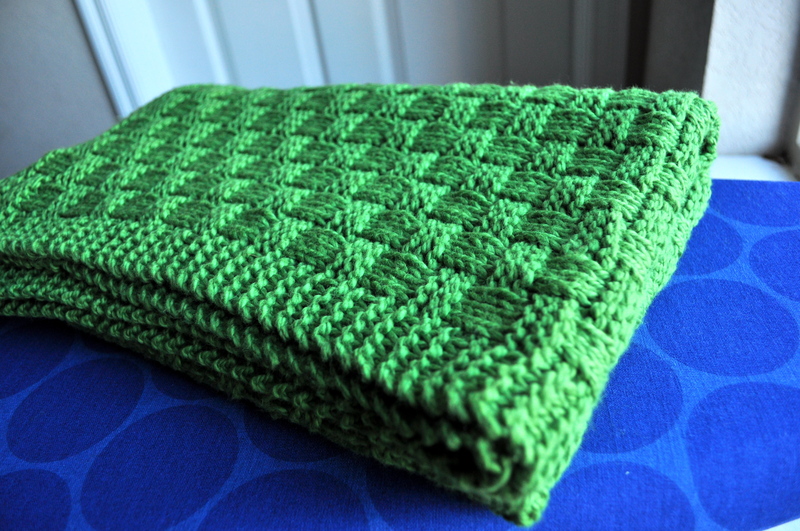 First, I knitted him a blanket in bright green Blue Sky Alpacas Dyed Cotton, with an all-over basketweave pattern. 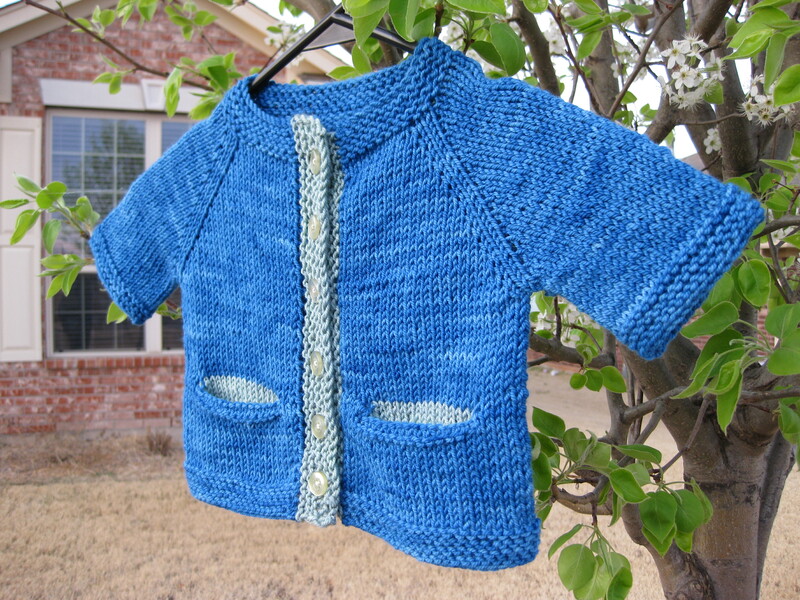 Then, I knitted him a little baby pullover in Malabrigo Sock – in the most gorgeous blue I think I’ve ever seen! 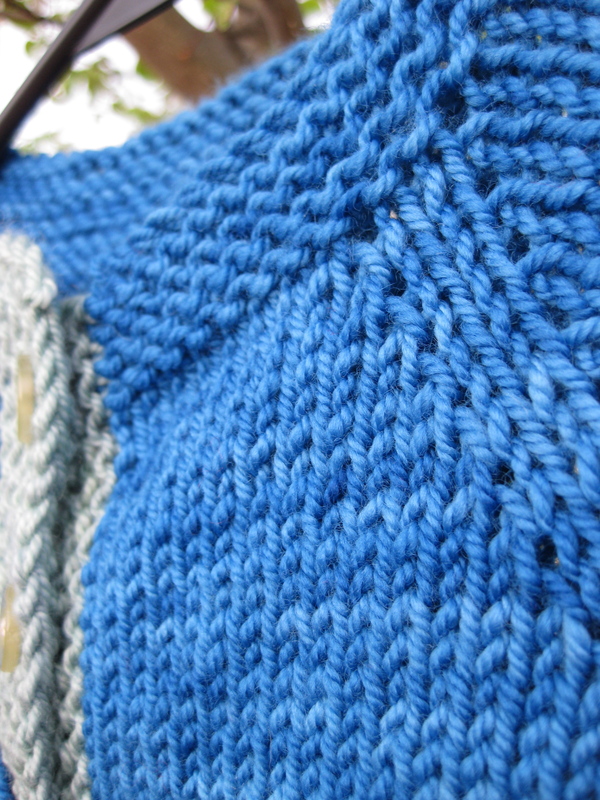 The colorway is called “Impressionist Sky” and that is exactly what it looks like to me. 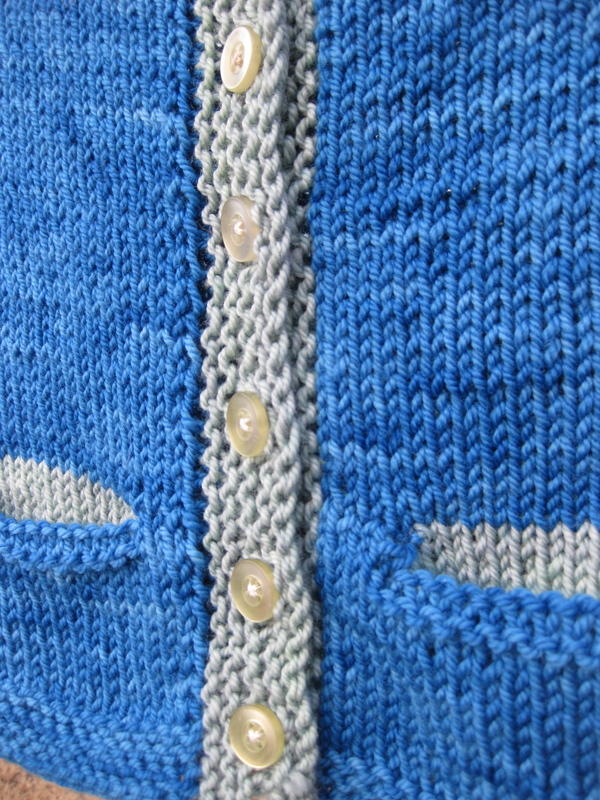 I love the crispness of the little 2×2 twisted rib on the cuffs, and I chose some little blue gingham buttons from my button jar for the collar. 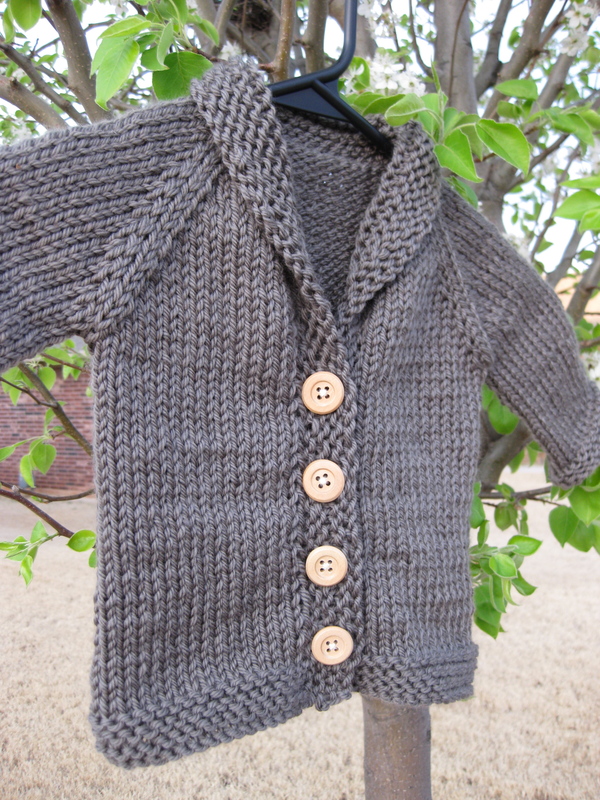 The buttons are purely for decoration in this case, seeing as I didn’t knit any buttonholes (I’m going to assume this baby boy has a casual-unbuttoned-collar type of personality). 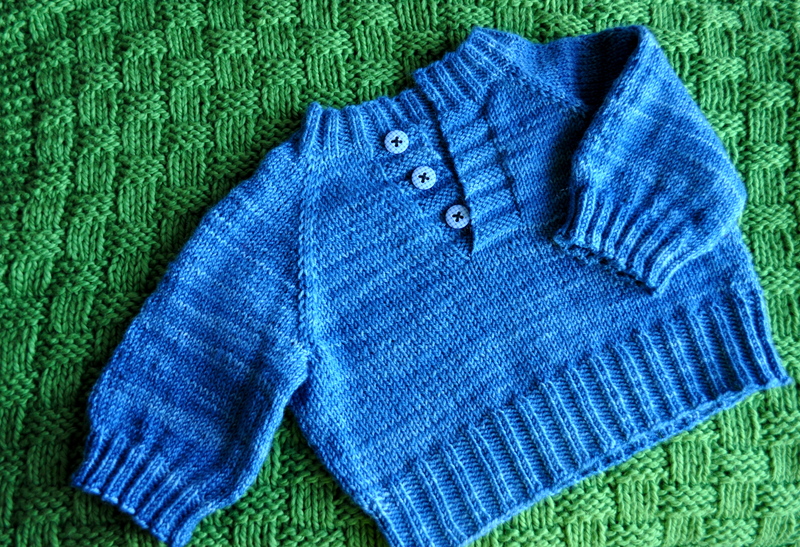 I love this little set because I can’t get enough of the bright green and blue together – last time I knitted baby things a chose more subdued colors (which I still love), but I like the change to bright hues this time. I just had to include this picture because of how regal Hugo is looking in the background! Look at how straight he’s sitting – adorable!